Welcome to Option Central ! 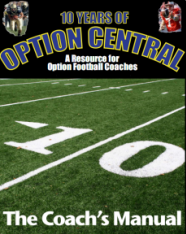 Now in our 20th Year, Option Central offers an extensive collection of information and resources for coaches of Option Football - and those who have to defend it. The Option Central Article Library includes articles provided by Guest Contributors that range from classics from (the first) Ten Years of Option Central to new articles submitted in recent years. The Option Central Resource Library includes option-focused videos, podcasts, online books and eBooks, along with coaching forms and other coaching aids that are suitable for use in any offensive system. Option Central Members have unlimited access to option offense videos from coaches like Larry Beckish, Jerry Campbell, Tony DeMeo and Rob Zeitman , Rich Hargitt and our entire series of Play of the Day Chalk Talk videos. Also available to our Members are Defending the Option articles, webinar style chalk talks and full length, DVD-Style videos that explain how to defend the option from various defensive schemes. BASIC MEMBERSHIP - An Option Central Membership provides unlimited access to our entire collection of articles, videos, chalk talks, podcasts and other resources at a cost of less than $4.00 per month (if billed annually). Memberships are available in 3 month, 6 month and Annual subscriptions. TECHNOLOGY "PLUS" AND STAFF MEMBERSHIPS An Option Central Technology Plus membership combines an Option Central membership with the use of football coaching software for the duration of the membership. Staff Memberships enable up to 3 coaches to enjoy the benefits of membership. Option Central was founded by Coach Mike Schuster in 1999. He wrote a message about the first 10 Years of Option Central . As we celebrate our 20th Anniversary in 2019, we discussed our development since 2009 in the 20 Years of Option Central .